Immerse yourself in panoramic views of Yosemite National Park; Chiang Mai, Thailand; and San Francisco using MapJack, a new alternative to Google Street View and Microsoft's Live Search Maps. 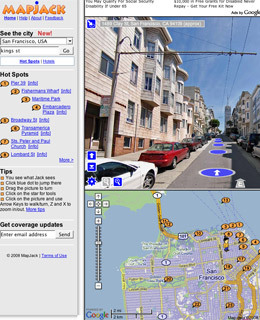 MapJack has brighter, sharper photos than the others, and better navigation tools. To start exploring, just click and drag the icon of a person along the map in the bottom half of your browser; the photographic images in the upper portion will automatically refresh. Start-ups like Earthmine and EveryScape are developing similar next-gen maps, but for now, MapJack offers the best preview of the future of digital mapping.